“Transformers” explodes into theaters this July 3rd. Collaborating to make those sounds more then meets the ear, are Sound Supervisor’s Ethan Van der Ryn and Mike Hopkins. This is the first movie the pair supervised since winning their second sound-editing Oscar for their work on “King Kong”. 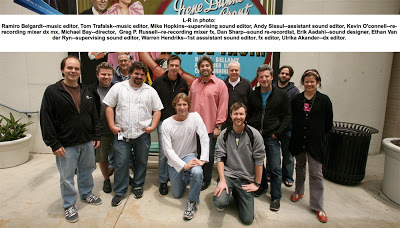 Sound mixing took place over at Sony with Greg Russell and Kevin O’Connell manning Effects and Dialog/Music respectively. The mixing duo have mixed all of Michael Bay’s films and already have a summer hit with Spiderman 3. Peter J. Devlin shot the production sound on the film. Devlin another return Bay craftsmen, has worked continuously on the director’s films since “Pearl Harbor”. Composing duties went to Steve Jablonsky. Jablonsky has scored all of Bay’s Platinum Dune’s films, and also composed for Bay’s last outing ,“The Island”. A great article on the tracking can be found here. I wanted to thank Sound Supervisor Ethan Van der Ryn for taking time to do this Q and A. Had to ask it. Is the signature transforming sound from the cartoon in the film? 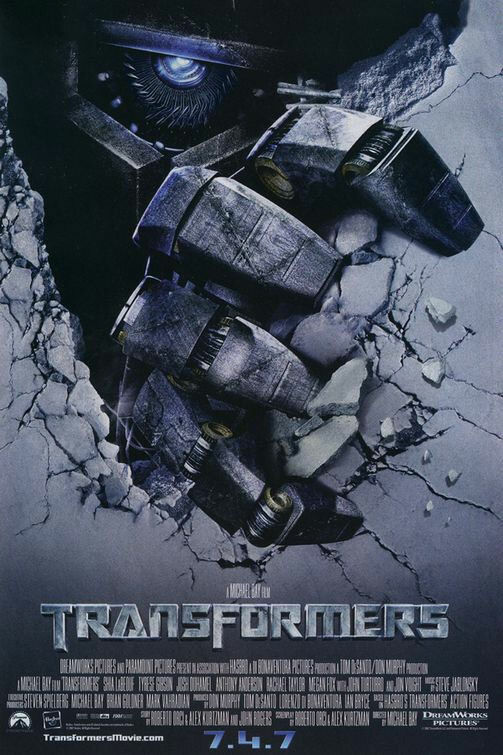 EV: We used the original transforming sound twice in the film. It is used for one of the largest transformers and also for the smallest. More importantly we were inspired by the original transformation sound in the creation of new sounds. The very first sounds heard in the movie which play over the Dreamworks and Paramount logos are an example of sounds which are inspired by that original transformation sound vibe. With all those metal robots sharing screen-time, in what way did you guys give each of them a unique sound signature? EV: We came up with a unique palette of movement and presence sounds for each robot based both around it’s physical characteristics in vehicle mode as well it’s personality traits in robot mode. Out of all the Transformers, which was your favorite sounding? EV: Van der Ryn: Bumblebee is my favorite sounding Transformer. For me he is the most emotive robot in the film and the emotional center of the film. He manages to achieve this despite or perhaps because he has a damaged voice box which forces him to communicate with a montage of sound fx and songs and old movie lines. This by my count is your sixth sound collaboration with Mike Hopkins, how do you two distribute your duties as sound supervisors? EV: I am responsible for supervising the FX/Sound Design and Mike is responsible for supervising the Dialogue/ADR. Through the huge films you have worked on, how has your view on sound’s role in storytelling evolved? EV: The film that I moved up from being an assistant to being an fx editor on was Terminator 2. On that film I discovered first hand how crucial the sound was in making the pictures, especially the CG elements believable and real in a visceral way. As visual fx and CG have become an increasing prevalent part of modern film making I think that the role that sound plays within these films has become ever more crucial. With the advent of digital editing the possibilities of combining and and layering sounds has become infinite. The limitless possibilities inherent within the new technology have created a new set of pitfalls. People outside the sound world often seem most impressed to know how many different sound elements go into making the complete track as in “it took 555 fx tracks to make up this scene, wow!”. What I have learned about sound through the films that I have worked on, is to strive to make the scene work with as few elements as possible rather that as many as possible. Like so many other artistic endeavors weather it be writing or painting or cooking the skill is about combining only the “right” elements that have the most “specific” and unique qualities to create whatever effect or emotion we are aiming to create. I am sure you guys got some great FX recording opportunities. What was your favorite day out in the field? EV: My favorite day in the field was a day spent recording helicopters at Kirtland Air force base in New Mexico. Recording the Osprey helicopters; the rotor wash was so strong that we needed to lay down on the tarmac to keep from being blown over, and take our headphones off to keep them from being blown off of our heads. What a blast, literally! Check back tomorrow for the continuation of the Q and A’s with Re-Recording Mixer Kevin O’Connell!